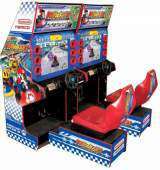 Mario Kart Arcade GP © 2005 Namco, Limited. The great classic racing game Mario kart series comes to the arcade, with excellent graphics, new characters and options of personalisation, also includes six stages divided into 24 tracks and all kinds of power ups items to increase speed or confuse and take out his opponents off the track, accelerating hard to win this fantastic race! The cabinet includes a camera which allows the player to take a photo and put it over its kart for multiplayer games. Dedicated 2-Player dimensions : 76'' H x 70'' W x 63'' D.
This game was shown at the 43rd Amusement Machine Show 2005 in Tokyo Japan. Released in December 2005 in Japan. Even though this game is based on the Mario Kart series, Namco's "Pac-Man", "Ms. Pac-Man", and Blinky (ghost) are playable characters in this arcade adaptation of this popular Nintendo franchise / Super Mario Bros. spinoff. This game carries the AAMA rating : Suitable For Players Of All Ages. 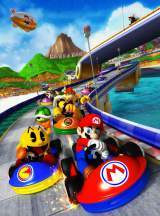 Most of the game's sound effects came from Nintendo GameCube's "Mario Kart - Double Dash?" * Starting Boost : During the countdown from 3..2...1... GO! Step on the gas pedal as soon as GO! appears. This will give you the initial startup boost. * Don't slip! : If you slip on a banana, and are about to spin out, hit the brakes. You will stop (not spin out), a music note inside a balloon will appear next to your driver, and you will have saved yourself a lot of time. 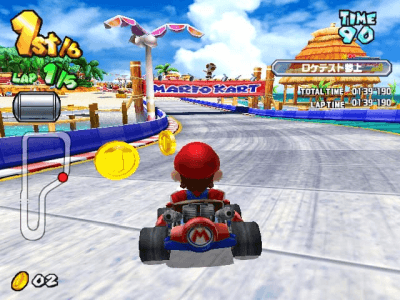 * 150cc Golden Kart Time Attack : First complete the first 2 rounds of story mode to unlock the 150cc Kart and then during the screen selection for the Story Mode or Time Attack, move the wheel to the Time Attack screen and press the red button on the right. The TA changes from 50cc to 150cc mode.